The celebration	of Friendship Day takes	place on the first Sunday of August every year. The tradition of honoring friends on a	specific	day started long	back in US around 1935. 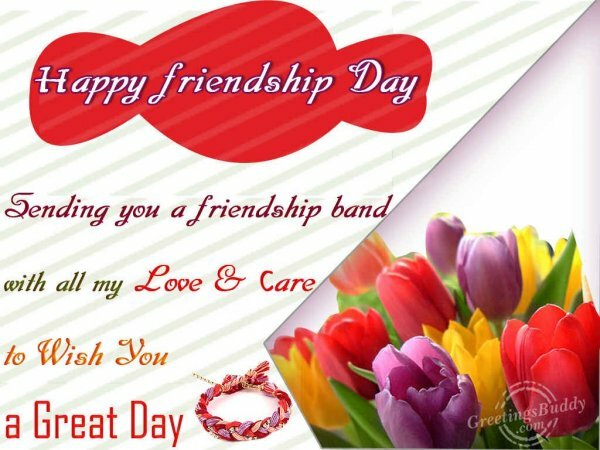 Gradually the celebration of the Friendship Day started in other countries also including	India. This is a special day dedicated for the friends and is to show how	important friends are in our lives. None of us can ignore the role of a friend in our life thus there is	a day fully dedicated for	the friends and friendship. In 1935, the National	Friendship Day was first	proclaimed and	henceforth celebration of the Friendship Day became an annual event. In 1997, Winnie-the-pooh has been declared as the Ambassador of Friendship around the world. In the modern world, there are various ways to celebrate Friendship Day. Ideally people	like to spend the entire day with their friends and	they like to sit together talking, chatting, and having funs. Small outings are arranged along with the friends. To express our love and	affection for our	friends, we give	them cards, flowers and different types of gifts. There are	many types of friendship cards available	and we can even make the customized	ones with the help of the templates available on the web. People	even wear different types of wrist bands to	express their love and honor for this friendship day. Exchange of wrist band is also very popular.